The spotlight is back on the war in Afghanistan. Big time. In the wake of the very public dismissal of General Stanley McChrystal and renewed talk of a withdrawal date - there's lots of debate over what is now this country's longest war. As the U.S. continues to escalate troop levels, top officials are warning of a long road ahead. CIA Director Leon Panetta says the Afghanistan war has "serious problems." He says progress is being made, but the fight is harder and slower than anyone anticipated. Panetta cites problems with the government, corruption, drug trafficking and the Taliban insurgency. Speaking of corruption, The Wall Street Journal reports American investigators believe top Afghan officials have been flying more than $3 billion in U.S. aid and drug money to financial havens for 3 years. That would be our tax dollars. The Journal says President Hamid Karzai's brother, long suspected of being deeply involved in Afghanistan's drug trade, is one of the officials in question. What are we doing? President Obama has said U.S. troops would start pulling out in July 2011... although he seems to be hedging on that lately. Former Secretary of State Henry Kissinger is warning the U.S. exit strategy "provides a mechanism for failure." He says the public needs to be prepared for a long struggle. Here’s my question to you: Is success possible in Afghanistan? Let's think about it: the Afghan administration is corrupt and moving our money into their overseas bank accounts, the nation is a loosely connected group of tribes which must affect the formation and training of a national army. The dominant religion is one that is determined to keep the nation living in the thirteenth century. Although Afghanistan has been the graveyard of empires, the U.S. can still "win". We need to realize that this is more about building a new nation than fighting a war. This means that there will never truly be a 'lights out' moment in Afghanistan, but continued diplomatic involvement seeking to foster a fragile, new government. The problem is in the wording of your question. What is the measure of "success?" I don't have any idea why we are in Afghanistan beyond trying to catch the planners of 9/11. That sure has not been very successful. No, I do not believe we can ever have a clear victory in Iraq or Afghanistan. There is a never-ending supply of Jihadists who are poor, uneducated and totally brainwashed by their so-called spiritual leaders. And, it is unlikely that we will ever be able to eradicate extreme fundamentalism as long as we support Israel at the expense of the Palestinians and keep a military presence in Muslim nations. I don't think so and I've felt this way since it started. No other country has been able to tame it. There's illegal drug money to be made there. It's like Mexico – they can't tame the drug lords there either. When, after nine years of war, nobody can define what a "win" would look like in Afghanistan then it is time to get out. We are Americans. Success is always possible. Yes, Jack, the war in Afghanistan is very winnable, but it will take a great deal of patience from the American people during the interim. Our President is doing the right thing by keeping up the pressure in Afghanistan with troop build-ups; however because of the widespread corruption there, the overall mission will take considerably more time to meet it's goals and objectives, and that's primarily to get Osama Bin Laden, either dead or alive. It is imperative that they continue the fight over there because we don't need another 9/11 again here at home! What defines success? Successfully eliminating a sanctuary for al-Qaeda? Turning a region into a federal-style republic like ours? Forcing a medieval society to convert to a 21st Century culture with gender equality, electrification and literacy? Forcing loyalty to a corrupt central government at the point of a gun? Success might be putting our own confused nation into order and allow the Afghans to determine what form of culture and government they want. This misadventure must end, and soon. I am sorely afraid that our involvement in this misbegotten excuse for a nation will come to the same end that we did in Viet Nam. We need to declare victory now and leave that place at once. As my father once said, "Let them kill each other until nobody is left and then God can sort it out." Jack...When was it we forgot that you win a war by first defeating the enemy. Nation building as a pre requesit is an invitation to failure. I guess we forgot that also..
As long as we depend on the creation of a "just right" form of government in Afghanistan expecting them to "do their share" in fighting the Taliban or whoever.......we will loose. with the enemy then rule in partnership with us. So-called progressives have taken te guns out of our soldiers hands. I saw this happen in Viet Nam and it can only lead to failure. Success is relative. Pray for our Soldiers and the People of Afghanistan, especially the children. Success cannot be measured by capturing Al Qaeda members or through the elimination of the Taliban. Success however, can be measured through our ability to destabalized the middle east, which was achieved when coalition forces invaded the region. No win, will never be sucessful, Afghanistan just exactly like Vietnam. The American pubic is just being strung along like a bunch of sheep. Not in the long term. The Muslims extremests have a stronger long term will to conquer us than we have of stopping them. Eventually the they will take over all of Asia, Europe, and the U. S. because we don't have the strength of belief to stop them. I'm sure our grandchildren will be wearing burkas and praying to Alah 5 times a day. Afghanistan has always been unkind to those who invaded it. Define Success? If we kill them with bombs what will we have won? Territory? Does that mean it will be a client state for a indefinite period of time and become the occupier and enemy of whatever people are still alive and continue to have a target on our backs? I dont think anyone can Win, The question should ask, What should our role be? No matter how much military power we have, we cant be the nation builder without them resenting us. The only thing we can do is try to have International NGO's help to educate the population to grow a self sustaining economy for themselves. I've seen this movie before in the late 60s when American public opinion turned on Viet Nahm after the Tet offensive. It seems silly for us to continue to fight these asymmetrical wars. I like the Biden plan. Pull the troops except for trainers and supporters and use the drones to keep the Pakistani Taliban under cover. If the Afghans don't want to have a country, that is their problem not ours! We just shouldn't be there in a military capacity, so the question is not relevant. We, the U.S.A, spend way to much money on our wars and other wars. We need to just stop. We cannot change a people by force, it must be done in other ways. Afghanistan is no threat to the United States. If we brought all our troops home and had them keep out borders secure many of our concerns and problems would just go away. Plus we would bring all that money back into the U.S. I have a question that I've not heard asked yet. Why did we send troops in? I know the 911 attackers came from there, but didn't we successfully outsource knocking them off to the Northern Alliance? Why did the Bush administration think they needed to then occupy the country? Why is it still necessary? The US already succeeded in dismantling Osama's terrorist cell, that is why the US went there to begin with, success has been achieved. There are many countries, Somalia etc. that are being ignored and are no different than Afghanistan regarding the need for economic stimulous and a non corrupt government, this was not why the US went to war and not a reason to stay at war, time to go. Sucsess is possible, but it will only be achieved through routing out the Taliban training and funding the Afghan National Army so that if we cannot route the Taliban,at least the good guys will have the better funding and training when we leave. But with the current date for withdrawl, and the state the ANA is at, Kabul will become a second Saigon. 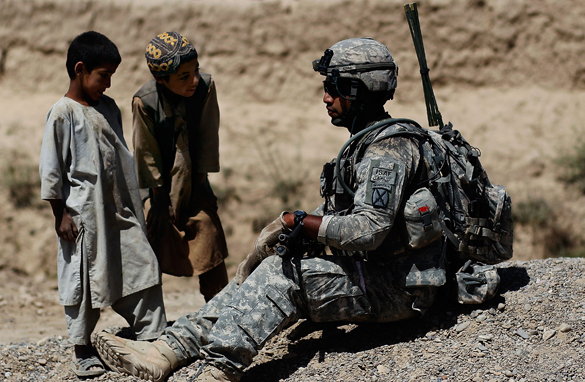 A stable and friendly Afghanistan is not possible with U.S. troops. Years ago, Democrats argued that it required an international coalition rather than unilateral action to win the wars. But during that last campaign, President Obama wanted to look tough on defense and immediately took over the war in Afghanistan as he promised. Now it's his war and it can't be won within the constraints of U.S. foreign policy. And the mineral wealth of that mountainous, land-locked country is no easier to ship to market than that of Bolivia (another poor, land-locked country). As a conservative I believe we should get out of there asap. Not winnable with a tribal culture, Karzai is corrupt and not worth shedding any more precious American blood. There's a reason there are no democracies in the Arab world. Victory is possible in Afghanistan, if we put our nation on a war footing (as it should have been for the past nine years) and commit those resources necessary to secure the whole of Afghanistan and govern it until the Afghan are capable of doing so themselves. Wasnt that the obligation to which G.W. Bush committed the US when he invaded Afghanistan and removed the Taliban government? Yes, it was, but he failed to meet that obligation. Now, it falls to Obama to do so. Let's not mince words. To leave Afghanistan (and Iraq) before it is secure and self-governing would be an unmitigated strategic defeat for the US. There can be no "Peace With Honor" in Afghanistan (or Iraq). Why are we fighting them at all? Oh I remember now, Bush said we will fight AL-KI-DA over there, so we don't have to fight them here. give me a break from this stupidy and madness. How about bringing our troops home from both of these Oil motivated wars. Lets have some success right here in the United States. Lets stop being the police of the world, let some other country do it for awhile, i'am sure most American would agree. This is another of those subjective political/military questions that cannot be answered conclusively. However, in reality and in all candor, objectively it can be answered emphatically with a simple and straight forward resounding NO! When entering into a violent conflict or war with a country that we have no legitimate or moral grounds for doing so, will never be and can never be stated as a "success" no matter the outcome. Afghanistan and Iraq are two such wars and will never honestly end in "success." To claim such will be yet another false political claim fabricated to protect those who erred for personal gain or political greed. Not in our lifetime Jack, you may kill thousands of Afghan's but you haven't changed the belief of those that are left and you never will, we could stay there for the next fifty years and you will never win and anyone who thinks we will is short about a dozen bricks short of a full load. Those crazy idiots over there kill their own people and we have smart people who don't understand that those type of people never lose even in death. Not as long as the current presidents of both countries are still in office. Although Afghanistan has been the graveyard of empires, the U.S. can still "win". We need to realize that this is more about building a new nation than fighting a war. This means that there will never truly be a lights out moment in Afghanistan, but continued diplomatic involvement seeking to foster a fragile, new government. My answer depends on how you define success. If you mean success as in the result of WWII, then the answer is NO, NEVER. Much must be done by the Afghanistanis which can not be done for them before a functioning country can exist, such as effectively dealing with corruption and the Taliban. If you mean succes as in the result of the Vietnamese war, then there is no problem. As I understand it, the purpose of sending more troops to Afghanistan was to stabilize the country so that they would have a chance of having effective governance, and of course so that the US could affect its escape. Hopefully the result will be closer to the this than to Vietnam debacle. Depends on what the definition of success is. We went there to oust Al Qaeda, and they’re gone. Mission accomplished! Time to come home and spend some of that money right here on our veterans and teachers, for starters. The radical Islamic terrorists killed 3,000 Americans on 9/11, and now we've lost 5,000 trying to get back at them. What's wrong with these numbers? How did we get involved in trying to restructure some God-forsaken wild country halfway around the world? The first step is to hold an election and get rid of the drug kingpin in charge. Why do we always end up cleaning up after the GOP puts a strongman with a drug background in charge? I can name three off the top of my head, can you? The answer is no, Jack. The COIN strategy championed by McChrystal and Petraeus is a massively expensive failure. Given that there are less than 50 Al Qaeda left in Afghanistan, why aren't the TEA partiers insisting that we do the fiscally responsible thing and get out now? Success is most definitely possible in Afghanistan. But it will require the commitment of sufficient manpower and the political will to stay there as long as it takes. Obama's plan to "surge" troops to Afghanistan was the correct step, but then he immediately negated it by promising to start withdrawing troops in 2011 in order to placate his anti-war "base". It's totally ridiculous. As it stands now, the Taliban simply believe that they can wait us out and then move in when we leave. We need to either commit enough troops to truly hold and secure all of Afghanistan, or withdraw altogether. But if we withdraw, it'll only be a matter of time until we're back there again. The defeatists (almost exclusively Democrats) said Iraq was "lost" back in 2007, and they were ultimately proven wrong. There's no reason at all save for a lack of will in Washington that they can't be proven wrong again in Afghanistan. It's hard to see how, unless we really scale back the definition of "winning"–and even then probably not without years more time invested. How much is "victory" worth to us–how many lives, how much money? Staying there until we declare it "safe" is probably going to cost more lives and money than any terrorist attacks that will come out of the area should we leave (and those attempts are still being made regardless, whether we stay or go). Jack, Afghanistan has been a failure for centuries and will continue to be a failure for more centuries to come. No amount to dead foreign troops or trillions of dollars has changed it nor will it ever change it. We went in to get bin Laden nine years ago. We don’t have him now, nor does it look like we will ever get him. That party ended a long time ago. It’s time to move on and invest in our own security and nation building here in the United States where we will get a far better return on our investment. I don't think success is possible anywhere in that part of the country. I think it is time to bring ALL our troops home and let them fight it out amongst themselves. They don't want us there anyway. The US is not the caretaker for all other countries. Please name the last religious war that "ended?" I am having trouble thinking of one. Any sensible American or Canadian must know by now that success in Afghanistan is impossible. Its culture and history are just too different from ours for our noble ideas of western democracy to take root and grow. But if you ask just about any high-ranking officer in the military, you will be told that success is just around the corner. It is just like asking a realtor if now is a good time to buy a home, or asking Bernie Madoff if he has any great investments he would be willing to sell you. It is time for our respective governments to listen to us. We want that wasted military money to be spent on jobs, jobs, jobs beginning right now, now, now. Of course it can be successful. Why wouldn't success be possible? Success depends on how well our leaders are able to dig their way through the problems. I for one haven't given up on them yet. Of course not. No foreign nation has ever won a war in Afghanistan, so what makes the current allies think that they can? Don't we ever learn from our mistakes? Putting it simply, not no but hell no. Jack you know we have to ask how you define success. Previous administrations and this one have made commitments that to a point, we have to live up to otherwise our word is worth nothing. If you define success as making a big impact on terrorist resources and activities in Afghanistan we have a chance. The problem is that the impact will only relocate them to Pakistan, Iran, Somalia and other friendly places. We can hope to change philosophy enough to make it difficult for them to return. If you define success as ridding the country of corruption, drug production, the Taliban, and bring all the tribes together in peaceful coexistence then not a chance Jack. War used to be fun and profitable. Our pathetic government can't even get this no-brainer right. No, success in Afghanistan is not possible, in any way that America understands success, which usually means some sort victory or winning. In Afghanistan, leaving, American troops coming home is the only positive outcome. Ultimately, win or lose, Afghanistan is going to be left to the Afghan people and whatever they want will be their future and that future is not a product of the American people, its government or military. If by magic there were no more al Qida or Taliban today and all our troops were already home Afghanistan would be considered a failed state and it will continue to be a failed state despite our best effort and good intentions. There is noting in Afghanistan to win. Jack this is and has been a waste of time and money. While the government is wasting 10 billion a month over there the US economy is crumbling and headed for a double dip that will last over 2 years. It is time Jack to clean house in Washington, these bums don't get it. There are so many mind boggling historical illustrations, as in Peter Hopkirk’s classic book The Great Game, as to why even a seemingly benign conquest of Afghanistan, in the name of Democracy, isn’t possible; and which doesn’t include the present day caveats of graft, corruption, drugs, a Trillion dollar mineral asset and the reported theft of over three Billion dollars of American aid monies by protected people within the present Afghan government. Then, too, there’s the lucrative ‘security contracts’ to the former Blackwater Corporation and our War Industry at large, which adds up the enormous financial gains for the racketeers in charge of both the Afghan government and our. Why should anyone seriously believe a peaceful solution is being sought? To paraphrase Bill Clinton "How do you define success?" Sure, Jack. The same kind of success we had in Vietnam. Yes if we turn the country to glass. A complete waste of time, money unless you're a subcontractor and more importantly American lives. Is success in Afghanistan possible? That depends on the meaning of success; the meaning of possible; what the meaning of "is" is; and how you define Afghanistan which many tribal leaders can't even find on a map. In short, I don't think anyone knows. But one thing is for sure success in Afghanistan will cost a lot more than the United States can afford in lives and money. Anything is possible Jack. The better question is, what are the opportunity costs of this war? We could have invested the funds allocated towards these wars in other ways that would provide better returns on the investment. We could have paid down our debt, and avoided the substantial increases in it as well. Perhaps we could have BOUGHT that country instead of tearing it down through war. No. Ask the Russians. Ask Attila the Hun. Afghanistan isn't even a country - it's just a tribal region that somebody drew on a map. Come on, Jack, get real. You SHOULD be asking is a DEFINITION of success in Afghanistan possible? No way!!! This will be like the vietnam war where the US lost. Sure, success is entirely possible. But it's got to be won at the grassroots level in conjunction with afghan commoners. Disincentivise helping our enimies. No. Just ask the Russians. This war is not, and has never been, about Afghanistan (which is why the military refers to this conflict as "Af-Pakistan"). When the extreme radicals take control of Pakistan and their nuclear weapons, the U. S. is already in position to eliminate the threat. Afghanistan is merely a staging point for the real threat in the area. Jack what the hell is success!?! As a former member of the Armed Forces, I can tell you this is a question that many members of our military ask themselves everyday. These people have been fighting for thousands of years and will be for thousands of more years were wasting our time trying to put a square peg into a round hole . Your answer is hell no . Read Barbara Tuchman's "The March of Folly". We never win wars of folly – and we're in two of them now. No, you can't win when you don't know who you are fighting. the war can be wone if the money boys think they have enought. Yes, success is possible, however it is not probable. The politicians and business men have ulterior motives we do not know about. For the them it might already be a success and we do not know it. Not a chance. We're dealing with generations of tribalism–hatred and corruption which has been bred into the very roots of the culture. Haven't you learned anything about history people?? Get out of the Wars. Winning, No such thing! NO! We're dealing with 12th century tribal barbarians. They haven't changed in the past and they won't change anytime soon. The war in Afghanistan can only be won with a more comprehensive strategy that revolves around civilian as well as military reform. A surge strategy that ends in July 2011 will not end the war, because it won't solve Afghanistan's lack of infrastructure and the government's lack of control. The military needs to focus on ending corruption and centralizing the government as well as training the military. That depends on what you mean by winning. Under the classic mentality of winning by unconditional surrender as in WW II, forget it. If you mean building a western nation in Afghanistan, forget that also. Perhaps crushing our treasury and losing the blood of our young for a maybe who knows is the reality. Yes, it's already a resounding success for Hamid Karzai's brother. We should definitely keep throwing our blood and treasure down that bottomless pit. If you define "success" as getting all of our troops out and leaving Afghanistan in the hands of a stable government, yes, I think we can be successful. If it means imposing America's laws and beliefs about religion, democracy and government, no, we can't be successful. Unfortunately not, trying to turn one of the most backward countries in the world into a Jeffersonian democracy is a joke with a very sad punch line. I hope we stick to some type of timeline that’s gets us out of what all sides currently consider a quagmire. Jack as a former member of the Army's 5th Special Forces who served in VietNam I can honestly say that there will be no Military Victory in Afghanistan. It can't happen as we have no support of the People. When this mess started America was told countless times that we were in a very long and very costly war .... America just hasn't the intestinal fortitude for long and costly wars. The Taliban have and the North Vietnamese had one weapon that we do not ...... infinate patience. Success is possible, but given most Americans' need for a quick and easy solution to every problem, I doubt we have the staying power to see the mission through. The alternative, that is a Taliban and al-Qaida victory, will send a message around the world that terrorism pays and that America does not have the will to do much about it. Leaving Afghanistan may make people in this country happy in the short term, but leaving there prematurely will have negative long-term consequences for us, ones we will have to deal with at some future date because we were too impatient to deal with them now. It will cost us more blood and treasure down the road. We will be tested, and our interests attacked repeatedly and more boldly because the terrorists will know that we do not have the will to take them on over the long term. The terrorists will see that we were not willing to defeat them "over there" even though they killed 3000 of us on our soil. What, then, will they plan in the future? What would be the definition of success? As long as we are there, there will be an endless supply of people wanting to do us harm. The country will never have the infrastructure to have a world economy other than the drug trade so the only success we will see is when our troops come home. Afghanistan has long been referred to as the "Graveyard of Empires", and for good reason. Alexander The Great, of all people, was stymied there after conquering all of the known world. Between the geography and the culture, there is no "victory" to be had. I wish I could say different but unfortunately I believe it to be true now and well into the future. Why not pull out all our troops immediaely? Fight the war from bases in sem-friendly contries like Pakistan with cruise missles, Air force bombing based on sattelite info. and use Neutron bombs to kill the Taliban hiding in the mountains. Save the boys and girls and strike with our advanced technology. Simple! Ask the Russians! Have we with all of our knowledge of history forgotten that these tribal nations have been at war with each other for the last 6000 years? There's nothing on this earth that is going to change these nations into a democratic society. End of discussion. Afghanistan will not be successful because the real problem is Pakistan, and Pakistan is a close friend of China which even gave it nuclear weapons, and China owns most of our debt. What success is going to be achieved? Who will be willing to let their child be killed or severely maimed to allow villagers to vote on their favorite taliban official? This is a big joke. Perhaps we are fighting to for the vast mineral wealth, so that the "New York Connection" can have more mining facilities in which to make billions. They already own mines in Africa, Brazil, Peru...etc. Are your children worth that? This ain't about democracy Jack. Of course success is possible. We need to defeat the Taliban in the same manner as we defeated the Japanese in World War II. First of all, we need to abolish the term "War on Terror," and change it to a war on Islamic Totalitarianism, just as we defeated the Japanese Shinto philosophy. Our military operations can only go so far, and ultimately it's a war on ideology that will win. The Taliban have read the New" US Army counterinsurgency manual" that we wrote, but obviously cannot read. Did we have a chance in Vietnam? Here is the same type " idiot" politicians leading us down the same primrose path. I fully support our military as I was a member for 20 years. However, I don't think this war will be won by conventional means. I would stop wasting our blood and money over there and keep them in our cross hairs with one finger on the nuke trigger. Jack, as an Afghan I would say that success is possible in Afghanistan. We need to take the war to the safe havens of the Taliban and Al-Qaida in Pakistan. The war wont be won by only sitting back in Afghanistan looking at the terrorists coming to attack us and the coalition forces. The terrorists should be targeted before they enter the boundaries of Afghanistan. Secondly, let's target the Taliban's funding sources, which are Irani and Pakistani governments. Hell NO. we don't even have an established objective anymore. What would "winning " look like?? War in Afganistan wiped Russia out not only as a super power, but devestated their entire economy for a decade. I agree Jack : what the hell are we doing??? this war money needs to go to US Nuclear power plants. That is something that is a plan for the future and measurable benefit. Almost 9 years we the United States was attacked on 9/11 in New York City and the Twin Towers came tumbling down thanks to Osama Bin Laden and his posse and back when we invaded Iraq in 2002 when we should have went into Afghanistan success would have been possible but now here in 2010 Im not so sure that success is possible in Afghanistan, I think this war was to little to late and this war will not be over by the summer of 2011 that is a timetable that is irresponsible and perposterous, we need to really think the Afghan war strategy! Jack, I hate to say this, NO!!! NO ... hasn't history taught us that a country with that kind of geography and that much corruption can never be made into a haven of democracy. Infact, i voted for Obama thinking that he is going to end all these wars ... since he gets it! but i was wrong. we are here going broke ... and we have to be prepared for the long haul ... for what??? until the people of Afghanistan want change and are prepared to commit to civil war like the rest of the free world has at one point, there will be no "winning" anything. Like people...you can't help where none is wanted. I thought invading Afganistan from the beginning. Before the invasion, we knew where Al Qaeda was. Now they could be anywhere. Wouldn't it be better if they had a base of operations? Makes them easier to spy on. Certainly success is possible; just look at all the examples in the history of Afghanistan where major foreign powers were involved. Oh, wait; which side did you mean would have the success? Jack, all depends on how we define success. Maybe we could claim success right now! We win, terrorist's loose, troops come home to their families. We throw a big parade in time square to celebrate. War over. Alexander the Great tried it. Failed. The Russians tried it. Failed. The Afghans have always seen the futility of trying to unite a country full of tribes that share nothing more than mutual hatred. It was pure folly for us to think that we could fly in the face of historical certainty. Of course it's possible, the only reason it couldn't be possible is if the unwilling American public keeps it's current stance or becomes even more unwilling to keep duking it out. It's better for Americans if we stay the course and win this war, even if it takes 10 years, leaving will only send a message that the worlds greatest power couldn't defeat a an enemy that we are supposed to outmatch on every playing field. History will also repeat if we leave and the taliban will take over again, and terrorist activity will be full blown in Afghanistan again. Not in the lifetime of my unborn grandchildren. It's time to get out of Afghanistan and focus on "wars" that can be won. Begin with the Gulf oil spill. Henry Kissinger is correct on the time frame but wrong about our people bracing themselves for a long struggle. The American people do NOT want this war in Afghanistan. Bring our military home. Last week on a CNN program during the McCrystal rumpus,I saw a former intelligence agent. He had years of service. He now owns his own private intelligence firm. He said that we would have to be there for 25 to 30 years to win this war. I'm NOT committing my grandson to go fight over there. Afghanistan is a graveyard for foreign soldiers. Get out not! We are only there for one reason – many already wealthy people are getting richer! Follow the money! Now that they have located a "treasure" in precious metals under Affghanistan why should we leave? That money should be used to refund what we've spent & continue to finance an American Base there. That is what we need to help them retain that "treasure" or it will wind up financing the taliban & any other terror orginization that is tied to them. I don't think the average American knows enough about the was in Afghanistan to answer this question. Democrats are too busy defending Barack Obama, and Republicans haven't yet been told by Rush Limbaugh what their opinion is! Seriously, this was has taken a back seat to the war in Iraq, the economy and job losses, and now to the Gulf oil gusher. Most Americans are just trying to pay their bills, and the cost of the wars is not helping. Is success possible in Afghanistan? No,' another Nam ! It is a hornet's nest....and I really doubt we can succeed unless we stay for generations...and even then, it is dubious given the area's history. I realize this war is symbolic in the sense that we are trying to change a philosophy, which just seems to get more entrenched the longer we are there.. It's more like we are winning battles and losing wars. Genghis Khan was the last invader to have any success in Afghanistan. The only success possible in Afghanistan today would be to successfully bring home our troops NOW and bring an end to this senseless war. I agree with Evelyn – not no but hell no. We didn't learn a darn thing from Vietnam. Bring 'em home and not in a box. Yes, it's winnable if the Afgans want it. The main problem, as I see it, is hundreds of years of the present culture that is not going to change by this time next year. We have ourselves some kind of tar baby. Jack, Only if you believe in fairy tails. We've lost over 5,000 troops trying to avenge the 3,000 lost in 9/11. And to what end? What is our end goal in Afghanistan? We can't impose our culture and our beliefs on democracy, government, religion, etc. on a nation that differs greatly from ours. If there were no drug users in the U.S, there would be no war in many areas of the world, including Afghanistan. There would be no funding. Until we can be drug free we will be sending our boys to fight in wars funded by our own citizens whose insatiable craving for drugs fuels this global insanity. sure it is, but only if we are actually determined and committed to achieving it. success has to be defined by a stable, free, and an Afghanistan that is a friend to America. as for failure we don't have to imagine what that could look like. it was our past failure in Afghanistan that is the cause of our precense in Afghanistan today. we can't go down that road again. we have no idea what victory will look like, but isn't it so much better than the failure that we are paying for now? No. not the way its conducted. You need a Taliban-like group to fight the Taliban and you can buy plenty in Afghanistan. you cannot flight Taliban and be worried about human rights and the right of the enemy being violated. We should hire one of the warlords like Dutom to take take Taliban the Afghan way! everything in life comes with duality. there will always be opponents and evil everywhere. better stop the war, bring people home, create jobs and start spending the money where it is needed: in US. What is your definition of success? Are we going to find Bin Laden? No, the time for that has passed. Are we going to get rid of the Taliban, probably not, but it would be sad to leave the people of that country in the mess that we created. Jack, It seems highly unlikely. Nobody has ever occupied that nation with any "success" going back to Alexander the Great. And what gives us the right to impose our idea of government on other people? Let the Afghans work out what they want. In 1987, Michael Gorbachov wrote in his book "Perestroika", page 177, "We want our soldiers home as soon as possible. The issue has been settled in the main. But it is connected with the need to settle the situation around Afghanistan politically. We support the present Afghan leadership's course of national reconciliation. The Soviet Union wants Afghanistan to be independent, sovereign and non-aligned as before. ' etc. etc. etc. So, what has changed??? Can we win the war in afgan. Sure, if we're willing to be the for the next couple GENERATIONS! You can't change a culture of people in a few years or decades, it takes generations. Yes the Afghan war is winnable if four things happen. Fisrt and foremost, let the Military do their jobs as they were trained, do't tie their hands. As with this war and all other wars there will be civilian casulties. Second we musat destroy all those poppy fields and show the Afghans the can be grown and be profitable. Third The Afghan people have to want to fight for their country and last but not least there has to be a Govt worth fighting for and supporting. But, I like many others knows the truth and those will never happen. What a waste of men and women. No , it will take alot longer ! American can win, and with far less of a military presence. America needs to reconsider every dollar it sends overseas, including military, until our economy improves drastically. We need to get back to providing for ourselves..
called Afghanistan " a devourer of armies." The day we went into that part of the world I wished Alexander the Great could have whispered in our ears and saved us. For many reasons success in Afghanistan will not be possible. Every day we remain will only cost lives. Everyone who says differently is afraid to tell the truth. You're kidding right? You actually ask this question? There is no chance of success in Afganistan with our present method of operation. The United States has not "won" a war or "achieved success" since WWII, why? Because the rules of engagement are absurd. If you really want to go to war, then you release the military and wait for outcome. CNN does not need to whine about schools or loss of life. That is why it is a "war". All we do is sacrifice young men and women for the advancement of politicians. Why did the allies win WWII? Because we used overwhelming forces to beat down and eliminate all opposition. Either beat down and eliminate all opposition in Afganistan, or get out. Here is a radical idea for victory in Afganistan: Outlaw guns. Train a modern police and military force comprised of women only. Educate them and give them something to defend: modern military bases with modern commissaries, libraries, housing, hospitals and schools for their children. Let the men fend for themselves. We are only in Afganistan at this point for the women and children. Move Afghans from the countryside to larger defendable villages and urban centers and train Afghan forces to take over the defense of those areas. Delivering aid directly to those in need of it should cut down on corruption. Duh! Afghanistan is a terrific success story, for weapons manufacturers, gun runners, drug dealers, smugglers, corrupt politicians, Blackwater, the list goes on and on. Afghanistan will forever be a dismal failure to the families of the fallen who gave so much for so little, and the American people who have lost the soul of their nation to the greed and avarice of political gain. "Success" will be achieved when the definition of success is modified to jibe with reality. Only Alexander the Great succeded there. No one else ever has. Alexander Used local leaders to keep the peace and run the government after he left but also had a man he could trust oversee them. Sound familiar? Why did his work and ours not. We chose wrong. Alexander also let the local chiefs run things but kept a tight rein on them also. If one proved corrupt he got rid of him and let the new official know that he better do it right. We tried to instill a western type government in a place that isn't prepared for it. Thus failure. We could go on but you begin to see the trend? Depends on what you mean by success. Will they become goo evangelical Christian - NO. Will they end up with a central government that is mostly in control - probably. But a strong central government will come about because it is necessary to efficiently tap its resources. Can we keep them from being involved with terrorist attacks - no, but we can't keep Americans from being involved with terrorist attacks. Is the war winnable? Yes, but it will take six or eight more years and I don't think the American people will agree to spend the money and lives to do so. Since this is a democracy, when enough citizens say enough, most of the politicians will pay attention and we will leave Afghanistan. I find it odd that Republicans who love to paint the Democrats as elitist snobs who think they know what is best for America, despite what the voters think, are behaving the exact same way when it comes to Afghanistan. Public opinion is against continuing the war in Afghanistan? Forget about those idiots, they don't understand what's going on. "Informed" people like John McCain and Lindsey Graham know what is best. Looking at the "success" thus far...it's only but a dream that John Lennon dreamt best: "nothing to kill or die for, and no religion too"
Success is possible in Afghanistan. When our troops leave the country the Taliban will take control of large areas; that is their success, corrupt officials will have a free hand again; their success, the opiumn trade will spiral upward and we will support their trade. They can"t wait for us to leave. We failed the first day we lost one of our soldiers for a lost cause. That country will then exist as it has for the past 300 years. Impossibly Yes! If all peaceful nations and people would stand together and say No! Reality check: a few someone's are responsible for the chaos. Read people, read for peace. Success as we define it, a functioning democratic Afghan state, is not possible. The middle class necessary to create such a state does not exist. A well defended and geographically limited base for special forces and drones to destroy specific Afghan/Pakistan based threats is all we need. We easily have the military power to maintain such a presence. No need for American kids to be die to create an optimum solution. We can only win in Afghanistan if we deal with the corrupt government. Otherwise, the people there will not trust us. Success is next to impossible in the Middle East. No one has been able to find success in the area – for one, the desert is a difficult place to fight a war. The locals know how to use their surroundings to their advantage. Alexander the Great knew better – instead of fighting, he married a woman. This gave him access and power to the region. The only way the US will have 'success' in the war is to pull the troops out to save anymore bloodshed. This is what we should do after reading most of these blogs. Leave Afghanistan and let the taliban build there next bigger attack. Do nothing about iran and let them get a nuclear weapon. Conclusion in about 8 year they both attack the US and blow the US off the map. For those who are left alive then they will say it is Obama's fault he pulled back the troops and did nothing. Possible? yes it is, but then again anything is. If you idea of success is removing the taiban from afganistan then it'll be a long struggle. It doesnt matter how many bombs you drop and how many people you kill, each person that dies is just another martyer and another reason to keep fighting. We will suceed just like we did in Viet Nam. It a never ending killing of noble US and other Nation's troops. Get out. Osama isn't there and the Taliban is in Iraq, Afghanistan, Pakistan and most likely the US. I watched the war in Viet Nam and a repeat in Afghanistan and Iraq. Those who ignore history are doomed to repeat it. I am digusted and sad. Afghanistan has a culture that the politicians, military, or ordinary people do not understand. We cannot win in a country that is so uneducated that you cannot win their loyalty by trying to explain a better way of life or why they should act differently. Pull the troops and stop the insanity of trying to change a part of the world that neither likes or wants anything to do with us. We are foreigners in a strange land and we need to leave. Believe what they tell you. This is the new Vietnam, why? Because our politicians have no will to act. But of course, the public will do what they always do.......baaaaaaaah, baaaaaaah. Does anyone at all ask why the United States has not won, nor even succeeded in a war/police action since WW!!? If you are capable, think about it. There is no victory in a war against a stateless enemy outside of the complete annihilation of the enemy. Anything short of this is slow failier at the expense of lives. We have niether the will or the means to destroy the Taliban. Karzai must stand on his own. A country that uses foreign troops to remain in power is illegitimate. We must leave. Karzai must negotiate power sharing with the Taliban. How many will die before we take the only real course for peace available? we could win if their was any help from the people we are trying to help .but those people cant be trusted. the leaders are making to much money on the war, time to admit enough is enough. " get out now " before the U. S. goes down the drain too like russa did. This will be an on going war to be fought with pulling our troops out, backing clans that are against the Taliban, special ops, and surgical strikes. You can never really win a war unless you kill them all. If we win this war in Afganistan, our next few generations will be paying for our so-call win. Muslins will remember what we did, and they will revenage. If we can not nuke them, the next best thing is leave them along. We already won. The original purpose was to defeat al-Qaida. We did. Somewhere along the line this war morphed into a war against the Taliban, The Taliban are backward, offensive, and primitive, but from my perspective, they never did anything to me or the United States. Only 50 members of al-Qaida are left in Afghanistan. Let us call it a win and move on. NO.......We are not committed to it! We haven't been committed to any war since WWII. You can't win at anything unless you are totally committed! I predict when the students realize we have given them all this debt because we bail out big business and fight wars that we can't win....they will revolt just like they did in the late 60's...history will repeat itself because we have failed to learn our lessons!! Of course I believe that success in achievable in Afghanistan because I believe in my President! Just as many believed in former Pres Bush's motives to go in there nine years ago ... and he ran it for eight of those years. Why is everyone questioning this President's strategy ... especially when he's trying to get us out of there in 2011. The former Admin. had no plan or intent of getting us out anytime soon. of course the war will be won so long as people stop viewing war like a video game. This is not just about quick bomb and kill. I have no doubt our service men and women are not just killing everything in sight. While we pursue terriost we help to make a nation stronger. We develop an allie that can feel safe to expand its way of life without threat of terriost in their own back yard. Like the us marshal we don't get tired pursueing those that have done wrong. We just need to get our ducks in a row, add in a healthy rotation of the strongest physically , mentally and emotionally. Reduce number of troops on the ground in Afg at any one time. All new troops comming into the armed forces will serve sometime in Afg as part of their military duty. Tucson, AZ – If you have not read any books about counter-insurgency, as 90% of the people with opinions about this have not, your opinion is without value. There have been over 100 conflicts of this type on record – most have been lost by the expeditionary army for having taken conventional warfare approaches. The few that were won were won by living with the locals, making local friends, avoiding all civilian collateral casualties, and driving a wedge between the insurgents and the populace. The expeditionary force must take the side of the local leadership AT ALL TIMES ON ALL THINGS. Victory begins to appear in such cases in about 18 months. We can "win" in Afghanistan if we stick to proven COIN principles – this means ignoring opium and circumventing rather than depending upon the Kabul government. General Dr Petraeus knows what he is doing – an NO Senators and few pundits know anything about how these things have been won before and can be won by us now in Afghanistan now. If you have not done the homework, you do not know what you are talking about! Religion is the only moral authority that has ever united the Afghan people. Let’s stop being a cash cow to drug lords and a corrupt government with no moral compass. We need to find a way to promote moderate Islam in Afghanistan with aid channeled through our allies in the Islamic world. What do you mean Jack? Why every day we win in afg. Boeing stock, General Electric stock, remington, colt all great american winners in the theatre of WAR. I would never invest in those companies, its an investment in HELL! "Success" in Afghanistan will happen when the Taliban hate Al Qaeda more than they hate the U.S. and that won't happen in my lifetime. It already is a success. Military contractors are making money. Opium traders are making money. The Military Industrial Complex is making money. Government Officials are making money. International bankers are making money. Sounds like a sucess to me. Jack – We already have had success: The CIA has made trillions from trafficking drugs through Turkey for support of building our underground military bases. The international contracting business on all levels has blossomed, and bank loans have proliferated to support this. A success already by many standards. Ask the Russian's. They were their for 30 odd years. They might know a thing or two about our situation. No, simply look at all the other countries that have tried and lost in that country. Alexander the Great, Genghis Khan, the British, Soviet Union and now the U.S. Who will be next to try conquering Afghanistan, China? There are some fights that are worth enduring, situations that TRULY threaten us. We went in and punished the Tals and installed a government (as corrupt as it is). I know the government will fail of course and throw the Afgan people into the stone age. That is how they have always been anyway. If our brain trust wishes to make us safe, beef up our intel and our borders. In 10 years we will hear the same morons who got us into Iraq and Afgan. say the magic words: how could we have known?" We need to get our troops home before any more die or are wounded and save a ton of money as well. If American forces can regain good relations with NATO it will make victory in Afghanistan in reach. NATO works extremely hard to help Afghanistan achieve indepence via building schools, hospitals, etc. Fighting isn't the only way to end this war. Absolutely. Progress is being made not only in Afghanistan, but more importantly in Pakistan as well. Support for bin Laden has fallen drastically just between 2005 and 2009 in Pakistan. Drone strikes continue to deplete the Taliban of important knowledge in bomb making and insurgent tactics. According to a UN report, six would be suicide bombers died in 2009 alone just during ritual man embraces before an operation. It is important that we keep in mind this is the enemy we are facing; not the elite trained ninjas media reports make them out to be. Lastly, the current anti insurgent operations only started months ago. Keep the pressure on and they will break. Remember when they said if we leave vietnam the communist will gain a foothold, they said the same thing in the 80's about nicaraqua threating communist in our own hemisphere! They will always have reasons for war, greed, a need to drive a vehicle that gets 6 mpg and so on. Its to bad peace doesn't pay as well. Can someone, anyone please define success? We've been fighting that war longer than any other in our history and yet I've never seen a solid definition of what we are actually trying to accomplish. If you don't know what winning looks like, how can you tell if you've won?